The main trekking season in the Nepal Himalayas is beginning September to early December is the main season for trekking in the Solu – Khumbu region Everest , the Annapurna Base Camp, Ghorepani , Mohara Danda, Langtang Himal, Himalchuli, Langtang , Mardi Himal , Dolpa ,Upper Mustang,Annapurna Circuit , Ganesh Himal, Makalu,Nar Phu valley and Manaslu as well as Kanchenjunga. While springtime, March to early June, is an ideal time for ascending Mt. Everest and some of Nepal’s other prominent peaks, fall generally offers clearer skies for trekkers. In the spring monsoon is fast approaching and skies are always hazy though it is warm even in high altitudes thus a best period for summiting of Mt.Everest Expedition. September and November is the ideal season for trekking. Great number of trekkers , Hikers in Nepal book tours from established Nepal tour and Himalaya trekking operators in the Nepal Guide Info Team or Nepal Planet Treks well before departing for their trip to Nepal . Many trekkers, however, come to Nepal entirely on their own hoping to arrange trek support in Kathmandu. So what are the costs associated with hiring a Nepal Mountain Sherpa in the Nepal Himalayas? Nepal Guide info minimum cost of a Sherpa is Rs. 2000 (Nepalese rupees), that’s about $20 per day. It’s important to note that this rate applies for the service of a Sherpa staff, a camp hand, porter or a cook possessing essential experience having worked with trekkers in the past, though the rate does not include allowance for his lodging and meals namely if staying in local lodges. 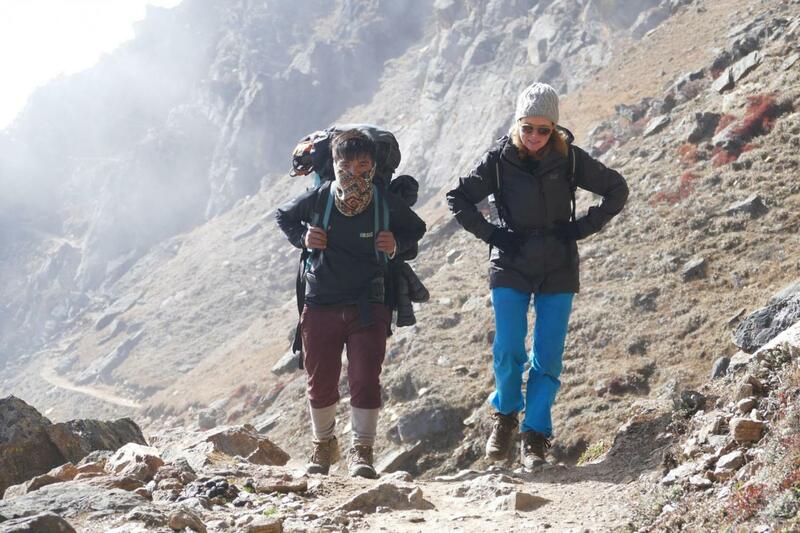 Those expenses will have to be covered by the trekkers in addition to the Sherpa basic rate. Tour operators will have to also pay for the Sherpa’ health insurance (rates start as low as Rs. 1000 ($100) per person) and in some instances, for example on certain climbing expeditions, the operators must also provide all necessary personal gear for the Sherpa, from special boots to down jackets especially if they will be working in exceptionally high altitudes. Experienced Nepal mountain guide ( Nepal Guide Info ) is referred to as “sirdar” and his will cost is well above the mentioned rate for Sherpa staff. Top expedition Sherpa sirdar can earn over hundred dollars per day, even more, especially on large expeditions when he manages a sizable team of other Sherpa. The head Leder guide or sirdar assigns and coordinates responsibilities of the entire expedition support team, hires and pays the porters, pack animals and their caretakers and makes all the necessary decisions regarding routes and camping sites.